This 13-acre Gentleman's Farm, charmingly named Idyllwild, is located atop Lookout Mountain. Formerly an equestrian farm, the secluded setting allows for privacy, tranquility and space to roam. Less than 2 hours from Atlanta, Nashville or Birmingham, this mountain retreat is the perfect getaway, yet still close enough to fine dining and a thriving arts scene in downtown Chattanooga (only 25 minutes), providing the best of both worlds  a true Town & Country lifestyle. More...The modern farmhouse has been recently redesigned and fully updated by the current owner, Michelle Workman, a nationally acclaimed interior designer. Michelle's tasteful attention to the latest trends, and quality finishes, are evident throughout the house and in the renovation, from the use of Mirage herringbone flooring in the library, to cutting-edge Italian porcelain sheet tile in the upper level bathrooms, no expense was spared in the quality of materials used. In addition, the home has been turned into an efficient smart home with smart thermostats, smoke detectors, lighting, locks and security. This home is built for an entertaining lifestyle; whether hosting multiple couples for long weekends, or large family gatherings, the layout and guest areas make get-togethers easy. Pool parties, barbeques, friends and family all fit in with this unique property. The 14-stall horse barn and three fenced pastures would also allow for an equestrian enthusiast to pursue their passion in style. There are multiple areas for gardening, whether herbs, vegetables or a cutting garden, and farm fresh eggs from chickens kept in the large custom built coop at the barn. Whatever you can envision, this is the type of property to make it happen. Enter the main floor from the gracious southern style front porch (with swing). The main floor's spacious entertaining areas feature a living room, dining room, eat-in kitchen and large family room, all providing good flow. You will find breathtaking views of the mountain landscape from the large open-plan kitchen and family room which lead out to the expansive back deck overlooking the pool, gardens, and pastures. The fully renovated kitchen includes Brazilian Via Lactea Granite countertops and glass tile mosaic backsplash. The dining room features grand style built-in china cabinets and a cozy fireplace, the length of the room accommodates a table of 12 as needed. The open-plan living room feeds into a game room with easy access to the kitchen for cocktail parties. The master suite has two walk-in closets, and the spa-style bathroom features a white Carrara marble mosaic floor with a double vanity and a soaking tub wrapped in large-format Italian porcelain tile. The other bedrooms on the upper level consist of a private bedroom suite, featuring a new walk-in shower tiled in large format Italian porcelain tile, a tile parquet floor and marble-top vanity. A pair of large children's bedrooms joined by a jack and jill bathroom also feature a marble mosaic floor and double vanity, The lower level is the ultimate in entertaining; a bunk room, perfect for weekend sleepovers, plus two more bedrooms are on this level, as well as a small kitchenette. Currently one side is being used as a home office and library, but would also make for an ideal game or media room, kept cozy in the winter by a brick fireplace. A full bath is conveniently located on this level for visiting guests or easily accessed from the pool area when needed. Other features of this property are a 2,600 square foot barn with 14 stalls and a tack room for horse enthusiasts, a pool and deck space for entertaining and relaxing, mature landscaping, and gardens. 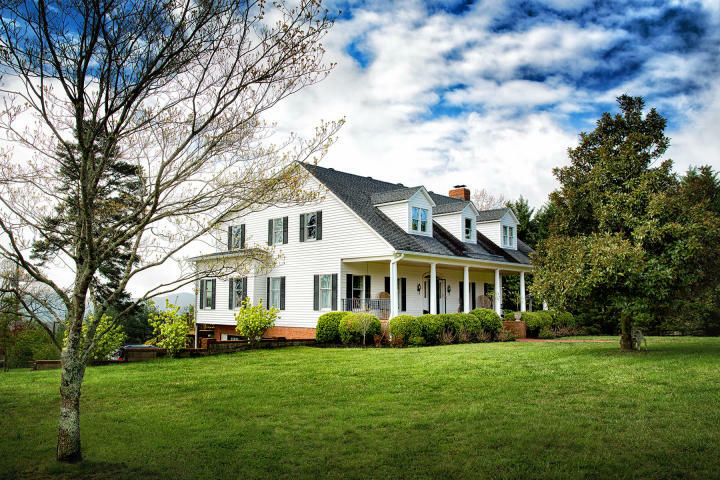 Whether you are looking for a pastoral gentleman's farm, an equestrian property, the ultimate in family entertaining, a wedding venue to remember, a must stay Air B&B, or a Vacation Getaway this retreat is one that must be seen to fully appreciate all its features! Escape to serene living at Idyllwild. Call for your private showing today.